More than 8,500 attendees to gather in Chicago next week to discuss all things unmanned. Few themes emerge with investments; are people waiting for spring to begin? It's been a relatively quiet period for investments in the robotics and AI space, yet companies still receive funding in the usual markets – including AI chips and unmanned systems. From cars to trucks, self-driving developers are earning investors' attention in recent weeks. Fifth acquisition marks another market for Raleigh, N.C., drone technology firm. How a video game company pivoted its real-time drone software to help in search and rescue operations. 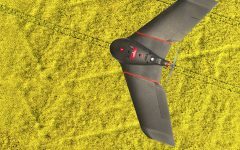 RBR Insider Report highlights how commercial drones are modifying their gear to provide help for farmers, foresters.